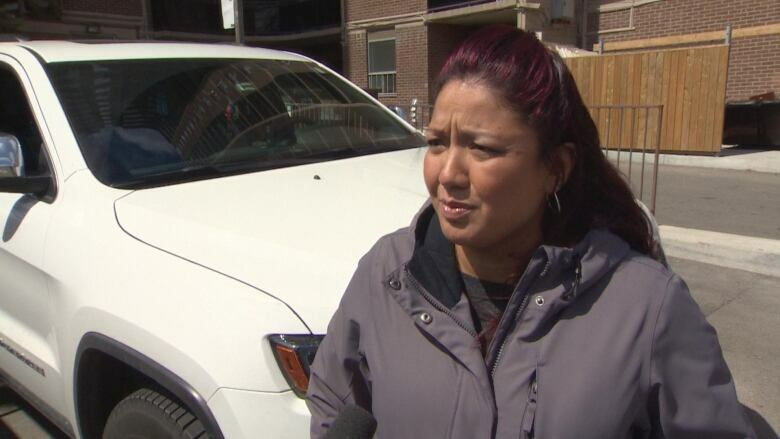 A husband and wife from Toronto say the manufacturer should compensate them for damage after their Jeep Cherokee, which was parked with nobody behind the wheel, suddenly lurched into another parked vehicle. But Fiat Chrysler suggests the owners are to blame. Leo Coronel was coming down Highway 400 when he says his 2017 Jeep Cherokee started revving uncontrollably, slipping in and out of gear, and the engine couldn't be turned off. "I figured, I gotta get it off the road, and find a way somehow figure out a way to turn off this car," Coronel said as he recounted the harrowing incident last month that ended up with his Jeep, parked with nobody behind the wheel, suddenly lurching into another parked vehicle. He manoeuvred the car to his local mechanic, desperate, he says, for help. "I felt like I was driving a death trap," he said. "It had a mind of its own." Coronel and his wife now say the automaker should compensate them for the incident that left his car damaged. But Jeep's parent company, Fiat Chrysler, suggests the owners are to blame. Security footage shows Coronel pulling into V-Tech Auto on Lawrence Avenue West at Caledonia. That's where he says he tried to put the car in park, but the gear indicator light on the dashboard was also malfunctioning, he said. "I felt it engage. I thought it was safe to just run inside and get the mechanic." Security video from the garage shows him getting out of the Jeep, and glancing over his shoulder, as he heads inside to get a mechanic. About 18 seconds later, the empty vehicle lurches forward, slowly picking up momentum before slamming into the back of a pickup truck parked on the lot. "I fixed a lot of cars, but I've never seen that before," V Tech Auto's owner Henry Nguyen told CBC News about the Jeep. "It was like magic" he said. Nguyen finally managed to shut the engine down by disconnecting the Jeep's computer. Coronel and his wife Shirley contacted Jeep's parent company, Fiat Chrysler Automobiles (FCA) to report what happened. A spokesperson for FCA responded to questions about the case from CBC News in an email. "FCA Canada regrets this customer's experience," Eric Mayne wrote. "The Company is unaware of any comparable events. Technicians discovered an issue with a single vehicle component, which was remedied free of charge," the email reads. But FCA wouldn't pick up the $4,500 it cost to repair damage to the Jeep's front end caused by the accident. Coronel's wife Shirley says they turned to their insurance company. "It was deemed a collision, at our fault," she said. "Our insurance ratings are going to be going up, on top of everything else that's happened." FCA suggested the owners are to blame for not following the Jeep's owner's manual, which states drivers should always apply the parking brake when parking. The company also pointed out that Ontario's Ministry of Transportation drivers' handbook tells motorists to use their parking brakes. "As the customer indicates, the collision was avoidable, had operating instructions been followed," wrote Mayne. Shirley Coronel doesn't see it that way. She says the vehicle's malfunction caused the problem. "The car just went off by itself," she said. "It could have been a lot worse," she added, noting there's a bus stop at the intersection where the accident happened. "We'd like them to take this seriously." CBC News reached out to Transport Canada to see if there have been other reports of problems similar to what the Coronel's experienced. "The manufacturer has not reported any safety recalls to Transport Canada for this problem in 2017 Grand Cherokee vehicles," wrote Annie Joannette, a senior communications adviser with the federal agency. Mayne says the problem that caused the Coronel's Jeep to malfunction is in no way related to other transmission complaints from other Jeep owners online. The Coronels bought the Jeep less than 18 months ago. It's their third and last FCA product, they say. "It's definitely not something we're happy with" said Shirley Coronel.